The pair popped into a studio in Los Angeles to work on the track which is due to be released early next year. 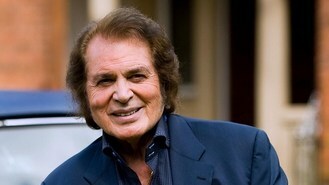 The "Eltonbert" collaboration will appear on an album of duets being assembled by 76-year-old Engelbert. His new album will come 45 years after his first massive number one single, his signature tune Please Release Me. Engelbert - the UK's entry for Eurovision earlier this year, although the track flopped - said: "This album is a true labour of love. We have a few more recordings to go, but what a cast. I'm keeping most of it under my hat but was so excited about working with Elton who I have admired ever since first hearing him that I just couldn't keep it to myself. "I'm honoured that he has contributed to this album. Sir Elton said his new recording pal was "one of the sweetest and nicest people I have ever worked with". He went on: "We had a great time singing together and he is so quick, what I call a 'one-take singer' - 76 years old and still sounding as good as ever".